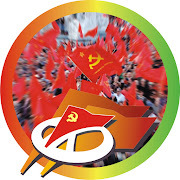 Regarding the ongoing developments on the Macedonia name dispute and the negotiations between Greece and FYROM, the Communist Party of Greece issued the following pamphlet-statement. “The arsonists of the Balkans- NATO, USA, EU- do not want to give a solution for the people's benefit! 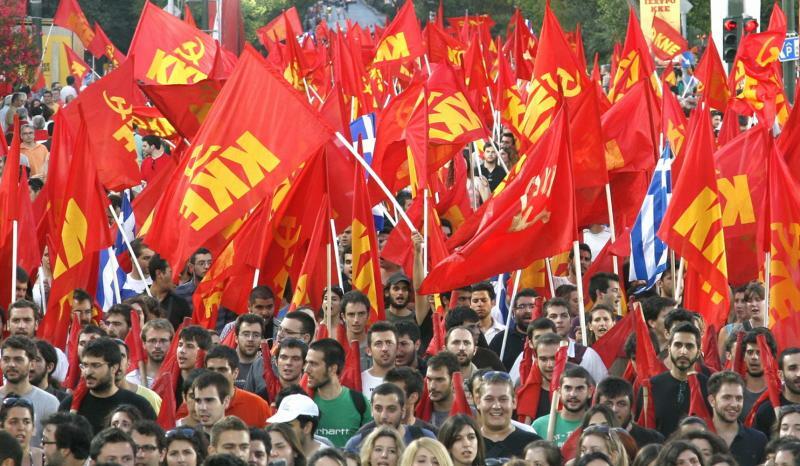 The KKE calls the Greek people, who are genuinely concerned about the developments on the FYROM issue, must see the essence of the problem, the “forest” and not the “tree”. They must overcome the disorientation and the false dividing lines that both the government as well those powers who invest on nationalism and irredentism are cultivating. Both sides, regardless of their placement, highlight the name as a key issue thus concealing the dangerous scene that is being set-up. They hide their agreement with NATO's umbrella, under which the negotiations are being conducted, aiming at the accession of the neighboring country to NATO. To become (more) strengthened in the fierce competition with other powers, such as Russia, China, focusing on the control of the energy sources and roads, of the market shares. It is an unhistorical mockery that the accession of these countries in NATO-EU will ensure peace and stability, that will prevent dangers to our country. Utilize existing and non-existing minority issues, inciting nationalisms and irredentisms in order to “divide” the people. The Greek-Turkish relations prove that NATO membership not only does not guarantee peace and territorial integrity, but instead it consists a factor of problems' intensification and questioning of sovereign rights. Even if there is a compromise, it is certain that this will be fragile and when the correlation (of forces) changes, new agreements and geopolitical balances will be sought, either by war or with the gun at the people's head. 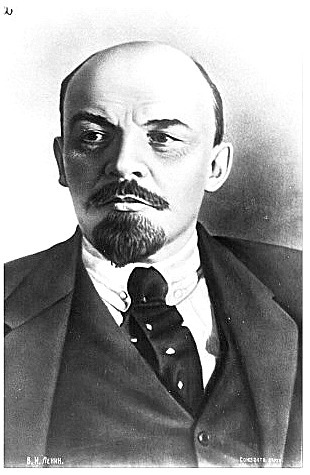 The “nomenclature” conceals the imperialist plans, the real problems. 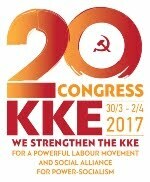 Since 1992, when the issue of the neighboring country's name was raised, after the dissolution of the former united Yugoslavia, the KKE had been placed by principle, in order to promote the friendship between the people, against the plans of the imperialists and the change of borders in the region. 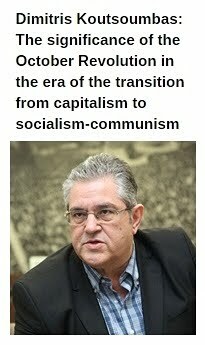 Among these parties was Synaspismos (later SYRIZA) which, alongside New Democracy and PASOK, was signing joint communiqués attacking the KKE and fueling the anticommunist hysteria. The KKE bases its positions on the undisputed fact that Macedonia is a large geographic region which has been shared between four Balkan countries on the basis of the Treaty of Bucharest, signed by Venizelos in 1913. Then, they took: Greece 51%, Serbia 39% (FYROM), Bulgaria 9,5% and Albania 0,5%. The questioning of this reality, with the slogan “Macedonia is only Greek”- meaning the whole geographic region of Macedonia- opens the bags of Aeolus. 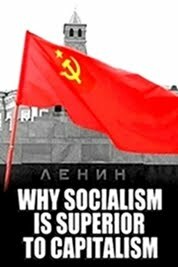 It feeds nationalism and irredentism. It gives a push to those who covet a revision of International Treaties, such as Turkey's ruling class which questions the Treaty of Lausanne. This is how the wick will be lit in the barracks of the Balkans. 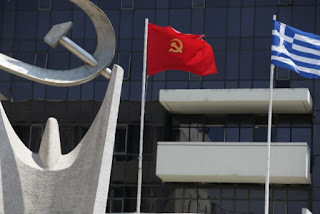 The KKE considers that the most signficant issue is the safeguarding of the relations of peaceful co-operation, the safeguarding of the inviolability of the borders of the two countries, the change of the neighboring country's Constitution and the avoidance of every irredentist propaganda. This the only way to cancel the whole basis that supports the unhistorical theory about a “Macedonian nation”. This is the only way to safeguard the exclusively geographic determination, if the name of the neighboring country will finally include the term “Macedonia” or any derivative of it. The government, through the so-called “geostrategic upgrading” policy, promotes the participation of the Greek capital in the loot that is taking place in the region. This is the other side of the antipeople policy. The Greek bourgeois class expects to recover stronger in the Balkans, to win positions in hierarchical sectors, being benefited from the accession of these countries to the EU and NATO. That is why it [the government] is willling to close issues on behalf of the capital, no matter if it opens dangerous windows for the Greek people and the other people of the region. The KKE calls the people to isolate those nationalist, fascist powers which exploit their legitimate concern in order to sow the poison of nationalism and homeland mongering. Among them is the criminal Golden Dawn, the political descendant of nazism, during the period of which the Greek part of Macedonia was under bulgarian occupation. New Democracy and the other parties bear enormous responsibility, because with their stance they are “fishing in the burred waters” of nationalism thus acquiting such forces. At the same time they give the chance to the government to present the dangerous euroatlantic plans with the mantle of “progressivity”. 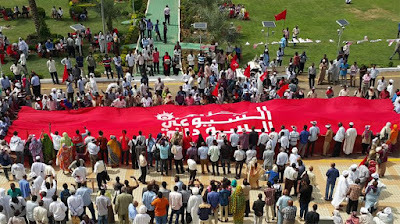 The common struggle and solidarity are their weapon against the plans of the capital and imperialists. 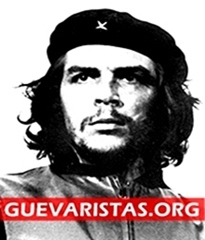 The developments impose vigilance, intensification of the workers-people struggle and internationalist solidarity, against imperialist interventions and wars. 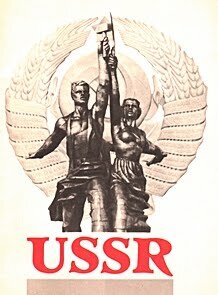 This struggle is inseparably connected with the struggle for the people's modern rights. 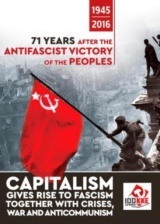 It is tied to the struggle against all imperialist alliances, such as NATO and the EU, against the capitalist exploitative system itself and the power of the capital”.